Five years after Superstorm Sandy, Howard Beach residents are still recovering from the powerful impacts. The process has been painful and frustrating, and it has served as a collective wake-up call for the Queens neighborhood and New York City. As recovery continues, the message that increased resilience will require an integrated and multi-pronged approach is becoming clearer. For all that planners, policymakers, and others talk about the resilience of the built environment, attending the Community Planning Workshop in Howard Beach during the 2017 National Planning Conference and hearing the personal stories of local residents, one couldn't help but be reminded of the ultimate driver of any and all resilience efforts — community will and spirit. Howard Beach residents have it in abundance. During the walking tour with residents leading the way, I watched residents call out to neighbors along the way; I saw people out in their yards jump in and join conversations and drivers pull their cars over to see what was going on and talk with the touring group. I don't doubt the neighborhood was closely knit before Sandy from all I witnessed and heard. But I also realized another important element of those ties, one that relates to their enduring battle with flooding. They have to get the word out to each other when a higher than "normal" tide comes in. People have to move their cars, make sure people are safe, their things secure, high and dry. Neighbors share that burden. Residents led volunteer planners on a walking tour of Howard Beach. Photo by Ryan Scherzinger. That said, it's a part of life in Howard Beach as it is in neighboring Hamilton Beach and other Jamaica Bay communities. It's worth it to people. They are in the lowest lying area of the city, the result of glacial outwash plains that formed at the end of the last Ice Age. It's a unique setting in New York City — low density, but modest housing. You almost forget you're in NYC. That is, until a commercial airliner roars overhead, just a few hundred feet above, as it comes in for a landing at LaGuardia Airport. But the access to and views of Jamaica Bay are part of what keeps people there. 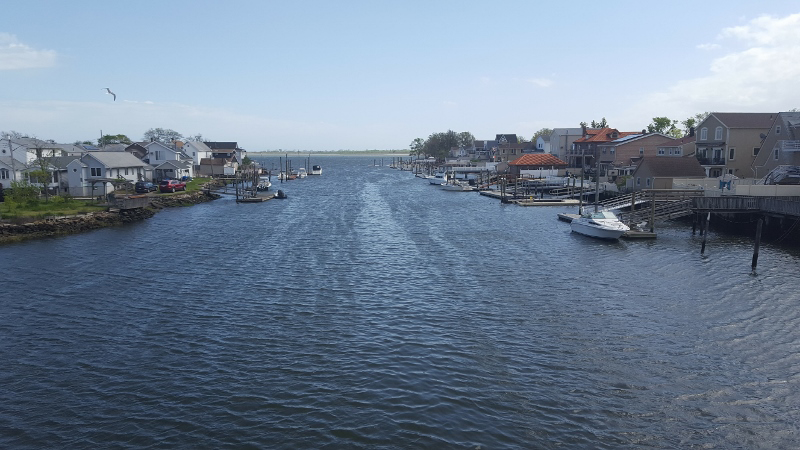 The view out into Jamaica Bay from a pedestrian bridge over Hawtree Basin that connects Howard Beach and Hamilton Beach. Photo by Ryan Scherzinger. 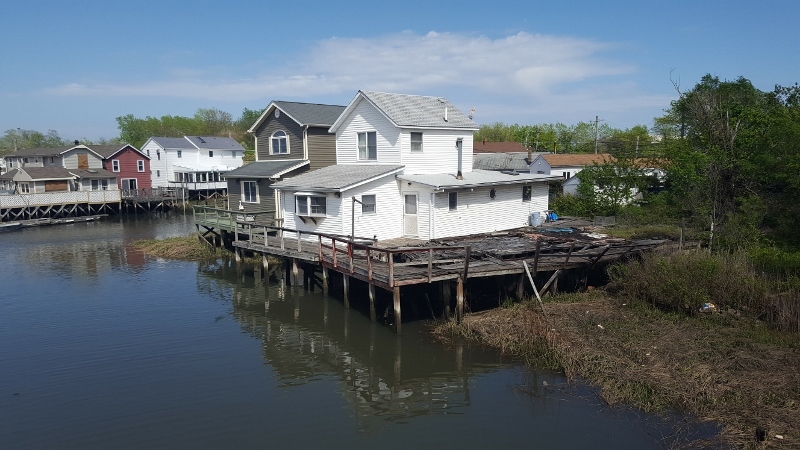 Many houses in Howard Beach are raised on stilts. Photo by Ryan Scherzinger. 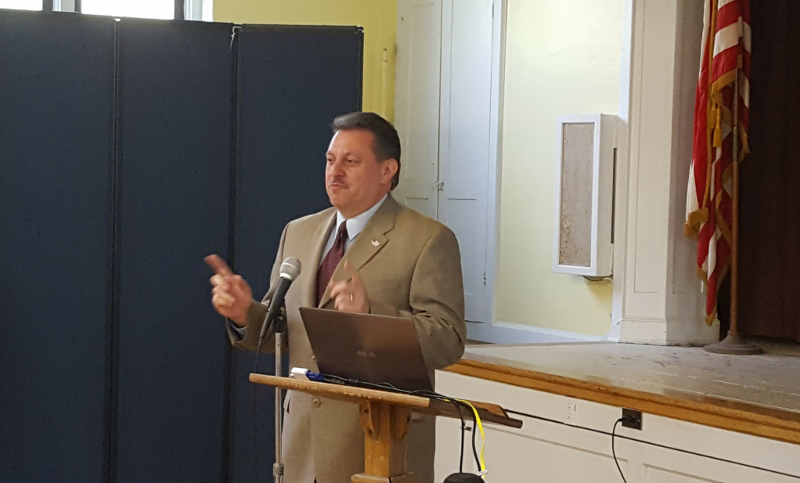 State Sen. Joseph P. Addabbo, Jr. (D, 15th District) opened the workshop. As a resident of Howard Beach, he is no stranger to what happened during and since Sandy, nor to the persistent problems of flooding in the area. He described a “turning point” when ordinary citizens turned extraordinary as they bound together to help one another in the aftermath of the disaster. More than 800 homeowners are still dealing with the Build It Back program as they struggle to rebuild amid a shifting landscape of new rules and updated flood maps. Despite the challenges, there’s hopeful progress. Plans for a new protective berm in Spring Creek Park, which is a natural wetlands area buffer to the south of Howard Beach, are under way, and $18 million from the New York Rising Community Reconstruction Program is slated to help the neighborhood with a variety of projects and initiatives. New York State Sen. Joe Addabbo, Jr. who is also a Howard Beach resident, provided welcoming remarks to workshop participants. Photo by Ryan Scherzinger. NYC planner Melissa Herlitz and Climate Program Director Alan Cohn of the NYC Department of Environmental Protection presented background information to the volunteer planners and residents. Cohn offered a look into the various ways green infrastructure (GI) can be adapted to increase water quality and resilience. NYC contends with compound flooding issues, so a mix of solutions is important, including green infrastructure. While GI isn’t built to handle extreme scenarios like Sandy on its own, reducing impervious surfaces and increasing natural drainage and filtration can help alleviate flooding issues. Herlitz discussed a recent report released by the NYC Department of City Planning that focuses on Howard Beach. The study is a part of city planning’s Resilient Neighborhoods Initiative, which is “a place-based planning initiative to identify neighborhood-specific strategies, including zoning and land use changes, to support the vitality and resiliency of communities in the floodplain and prepare them for future storms.” The report includes land use and zoning update recommendations that match existing conditions, and Herlitz discussed the impacts that different levels of projected sea level rise will have on Howard Beach. Herlitz and Cohn agreed that in addition to land use and zoning changes and new infrastructure like bulkheads on low-lying street ends — which is where most floodwater enters — private property owners must become a more integrated part of the solution. The city owns only so much land; the rest belongs to them. 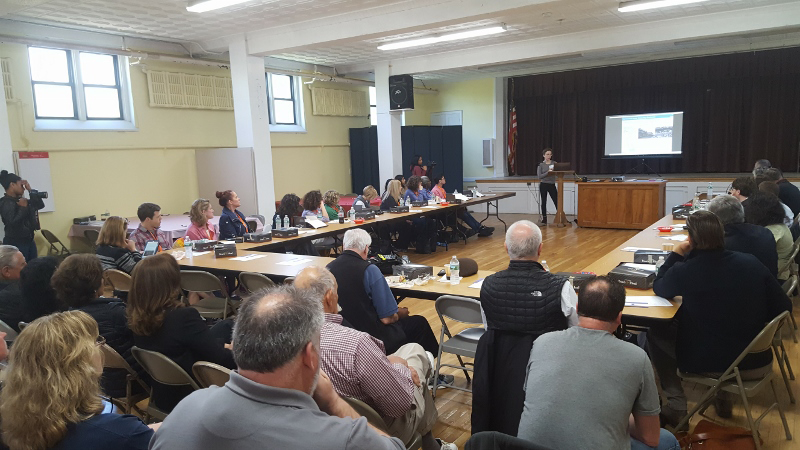 City planner Melissa Herlitz briefed the group on a recent study of Howard Beach through the Resilient Neighborhoods Initiative. Photo by Ryan Scherzinger. After the walking tour, the mix of volunteer planners and residents split up into breakout groups to discuss three topics: green infrastructure on private property, community and stakeholder engagement, and waterfront mitigation. Each of the five groups shared a summary of its ideas. As an example, residents expressed the lack of knowledge about GI among their neighbors. One group came up with the idea for a highly visible pilot site where citizens could learn about installation ideas and techniques, ways to reduce maintenance (a common concern of many residents), and the associated values of individual property and the community at large. 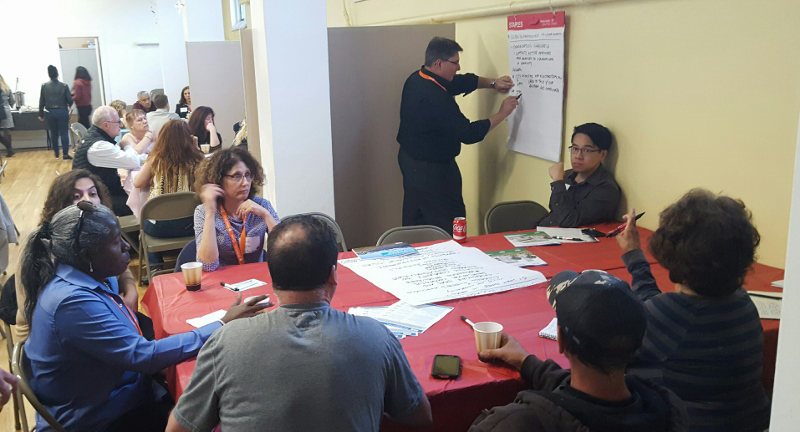 Breakout groups composed of local residents and volunteer planners from around the country and abroad discussed flooding issues facing Howard Beach. Photo by Ryan Scherzinger. Participants voted on the top three ideas of the day with stickers. Photo by Ryan Scherzinger. The annual AICP Community Planning Workshop at the National Planning Conference is always a great way to really get to know a local community and to be able to dig into the issues right alongside them. Howard Beach was another unique place to have that experience. I wish to thank the Institute for Building Technology and Safety (IBTS) who partnered with APA this year to organize and host the workshop. 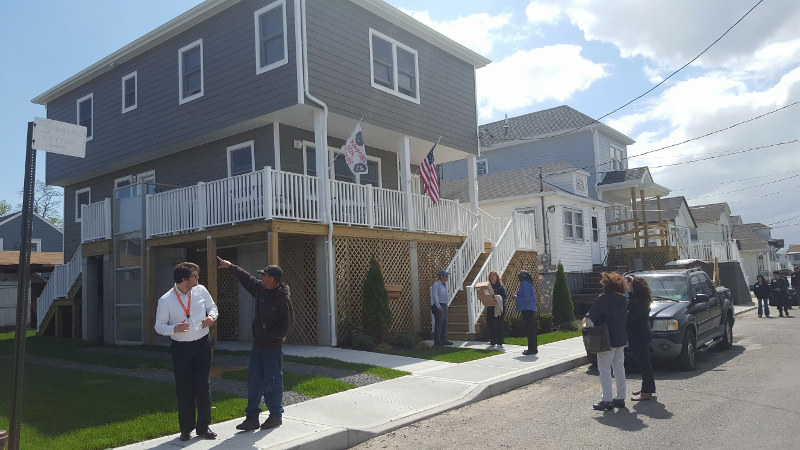 Participants visited a house in Howard Beach that IBTS is elevating during the walking tour. The National Resources defense Council (NRDC) was also very helpful in discussions leading up to the event. NRDC is exploring new approaches to green stormwater management solutions, which includes grants and incentive programs for private property owners. Check out the new Naturally Resilient Communities site developed by APA and partners. 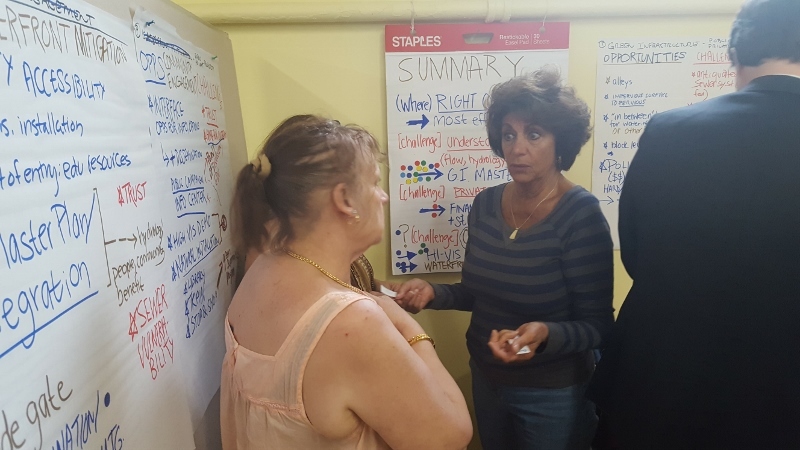 Finally, I encourage you to learn about APA’s Community Planning Assistance Teams (CPAT) program. CPAT is an ongoing effort by APA through AICP, its professional institute, to help communities short on resources. If you’re a senior-level planner (or professional in a related field) interested in offering your expertise pro bono, fill out the online volunteer form and let us know. Top image: Howard Beach canal with marsh and houses. Photo by Ryan Scherzinger. Ryan Scherzinger is programs manager in APA's Professional Practice Department.